I can still remember my first bow. It was an old fiberglass Bear “Red Fox” recurve. When my grandfather gave it to me he told me it was my mother’s when she was a child. It was nothing fancy, a long, skinny piece of fiberglass with a rubber grip that doubled as an arrow shelf. I remember feeling so cool shooting beside my grandfather. I shot it once in a while and had fun, but I didn’t get serious about archery until much later. When I was in high school, my dad, who was a long time rifle hunter decided to take up archery—mostly to extend his deer season and afford himself more opportunities afield. My dad has always gone out of his way to share his passion for hunting with me so, of course, I also got a bow. 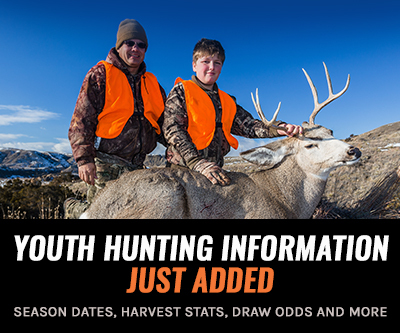 I started casually hunting with a compound at the age of 14. I would practice a month or two before the season and was lucky to hunt a couple of weekends with my bow before the rifle season started. It took a few years, but once I killed my first deer with a bow, I was immediately hooked. The excitement of being so close and the sense of accomplishment in finally making it happen was like a drug. I began to dive deeper into the world of archery in the years that followed, spending more time (and money) on my new found passion. 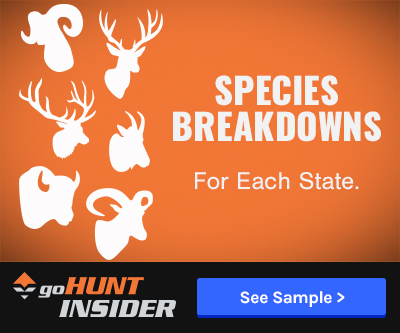 I hunted with my compound bow throughout my 20s with moderate success and even shot in a few tournaments during the offseason. After a while, the joy I once had in shooting faded. 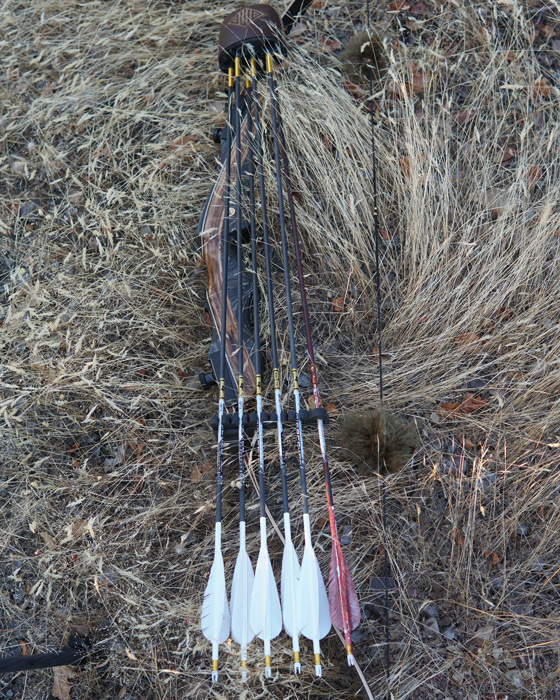 I still loved hunting with my bow, but the daily shooting had almost become a chore. Until I made the switch. Since watching my grandfather shoot his Bear Kodiak as a small child, I was intrigued by traditional archery and in February of 2017 I finally went out and bought a recurve. I started shooting immediately and, though the results varied, I was having fun again. I found myself coming home from work wanting to shoot. After about a month of practice, I committed to hunting with the recurve in the coming fall. For the rest of the year, I shot at least six days a week, even if it was only a few arrows each day. I made time to shoot because I wanted to. I even mounted a light over my target so that I could shoot at night. I learned very quickly that the importance of form and consistency was amplified with the stick bow. I spent hours fletching and testing arrows, researching shooting techniques and shooting. I was obsessed (just ask my wife). I tried multiple aiming methods, including a fixed crawl and gap shooting, but I found that shooting instinctive delivered the most consistent results. The simplicity of shooting a recurve is a big part of its appeal to me. There are no fiber-optic pins or drop away arrow rests to adjust: just a stick, a string, and an arrow. It took time, but soon I developed the ability to simply focus on where I wanted the arrow to impact and, then, let it fly. As long as I executed proper form and maintain focus, it worked. As hunting season drew nearer, I was confident in my ability to deliver a lethal arrow out to 30 yards. With nano diameter shafts and 250 grains up front, I was getting great penetration at that range. I knew that if I could get within 30 yards of a buck, I could kill it. If it were only that easy. I am fortunate to have a small piece of private property here in California to archery hunt that holds a few decent bucks each year. I started hanging trail cameras in late July and there were a few bucks hitting the cameras. I knew that killing my first buck with a recurve was going to be a matter of getting close so I decided to sit in a treestand in hope that one of the bucks would give me an opportunity. In the weeks before the opener, my target bucks were showing up on the camera less frequently, but they were still showing up. I went into my first sit on opening day with high hopes but only does came in. I had to work the next day and my brother-in-law sat in his stand (on the same trail) and killed a nice 3 point. My vacation started on Tuesday and I elected to let the area rest for a couple days and packed into the wilderness. I spent three days there and saw bucks, but was not able to get within that 30-yard limit I had set so I went back to the treestand. I pulled the card from the trail camera on my way in and checked the photos once I settled in the tree. There were still a couple bucks coming through, but it was well after dark. With the moon fading, I hoped they may show up with enough light for a shot. I sat for two more evenings, but each time I saw the same eight does. On my way home that night, I called a buddy and expressed my frustration. I was ready to give up on the treestand. He graciously offered up some information on an area that I had never hunted and I decided to check it out the following afternoon. I parked my truck around 4:30 p.m. and stepped out to the sweltering 113-degree heat. I grabbed my bow, shouldered my pack, and started hiking through thigh-high dead grass and volcanic rock. I walked slowly with the wind in my face, stopping frequently to glass ahead. I noticed a heavily used trail cutting across a distant ridge and decided to investigate. As I got closer I could see that the trail cut through the tall grass down to the dirt and was littered with big deer tracks. I checked the wind and crept slowly up the ridge; the bare earth made for much quieter travel than the dry yellow grass. Stopping to glass as I neared the top of the ridge, I noticed that the trail cut through a saddle and I decided that I would post up in the saddle for the evening in hopes of catching deer moving through. As I neared the saddle I caught movement on the periphery. I froze and turned my head slowly and was shocked to see a buck stepping out of his bed and start feeding on a branch above his head. I dropped to my knees, nocked an arrow and attempted to crawl closer. I moved a mere two yards before deciding that the dry grass was too noisy; I could make out the top of the buck’s back and his back tines as he continued to feed with his head back. He was big and close enough. 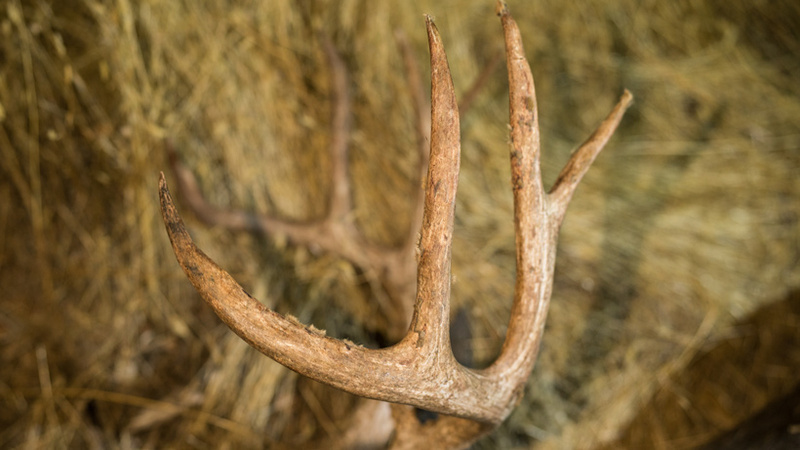 Setting my fingers under the string nock, I told myself not to look at his antlers; “Pick a spot.” I stood and drew simultaneously and focused on a spot behind the buck’s shoulder. As I pulled through the shot the buck turned towards me, but the arrow was on its way. Everything happened so quickly that I don’t remember hearing the arrow hit. After the shot broke, the buck took one step and disappeared over the ridge. I stood there dumbfounded for a few minutes trying to process what had just happened. “Did I miss?” I pulled out my rangefinder and checked the distance. The buck was at 26 yards when I shot. Still unsure, I walked up to where he was standing and found blood. I walked back to the trail and sat down. I now knew that he was hit, but unsure of where I decided to wait at least an hour before taking up the trail. It was now 6:30 p.m. and I had a little less than two hours of light left. I called my dad and told him what happened and he encouraged me to wait as long as I could. I called my hunting buddy to thank him for the hot tip. After an hour and 45 minutes, I decided to look for my arrow and start tracking. 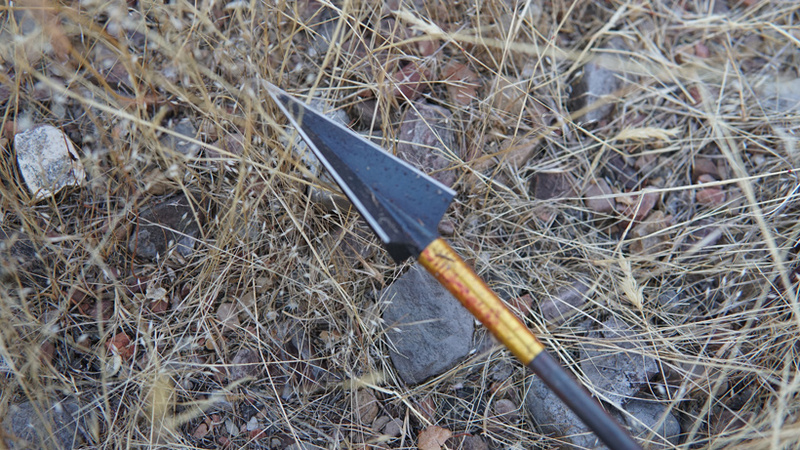 Crawling into the manzanita brush that was behind the buck, I found my arrow stuck in the ground. The white feathers were painted red. There wasn't much blood to speak of on the ground, but the tall grass was disturbed so I followed it on my hands and knees. Ten yards of crawling and I was on blood again. I stood up and took a few steps before seeing an antler sticking up out of the grass ahead. The buck went a mere 40 yards after the hit and died, piling up in a small drainage. I stood in awe for a moment and lifted the rack out of the grass. I didn’t spend much time judging the size of the buck before the shot and was in shock when I realized what a great buck he really was. I snapped a quick photo and sent it to my brother-in-law, Jason, who immediately called me. Jason left in the middle of dinner and rushed out to help take photos and pack meat. On the trip back to the truck, I reflected on all of the hard work and preparation that preceded this night and how fortunate I was to stumble onto such an awesome deer. 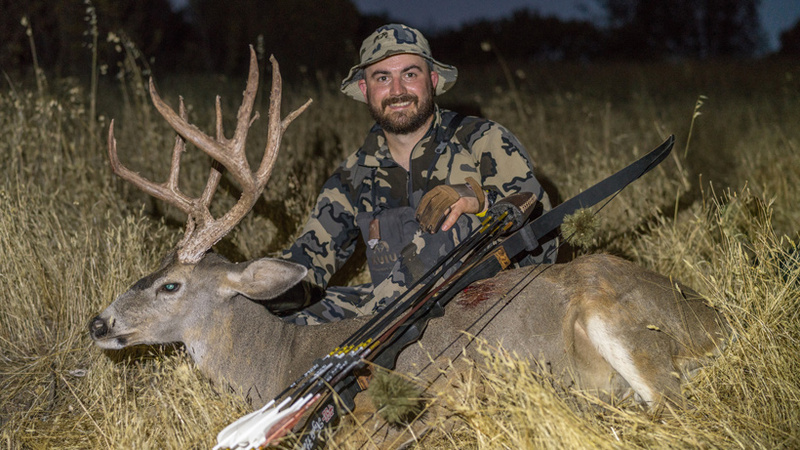 Though this buck lived on the wrong side of Interstate 5 to be considered a “true” blacktail, he is the biggest buck I’ve killed in 20 years hunting in California. When I made the decision to switch to a traditional bow, I assumed it would be difficult. I didn’t expect to have much success in my first year hunting with a stick bow much less on a trophy deer. There were many times when I doubted my decision and a few times I was tempted to pick up the compound. In the end, I am so glad that I stuck with it. 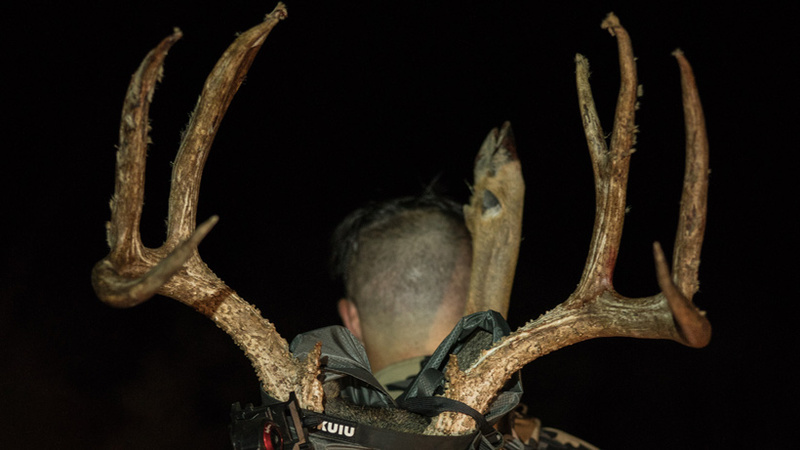 The experience I had on this hunt and the sense of accomplishment that came with it is unmatched in all my years of hunting and I know that I will be chasing that rush as often as possible in the years to come. If anyone reading this has any interest in shooting a traditional bow I would encourage you to pick one up and start shooting! Howard Hill had it right. He traditionally used a 110 lb. long bow and must have been one strong guy. The use of heavy arrows works well and it appeared that the arrow passed through the deer. Good job, respect for the game buy using proven equipment did not allow the deer to suffer. 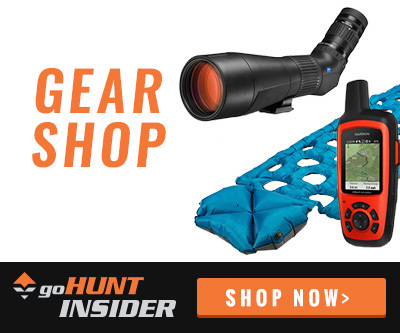 It's much less complicated than a compound bow and fewer things to go wrong. Today's archery business has taken a very simple function and made it way too complicated. You never pick the wrong pin. You never pull back and hold, hold, hold, allowing tension to build up. Fred Asbell, Byron Ferguson and the rest had it right. You pull back when the moment is right, and when you think the sight picture looks about right, you let the arrow fly. Archery was never intended to be a test of strength. Wow, that is the buck and story of legends. Great fortitude. Nice buck and awesome story. Congrats!